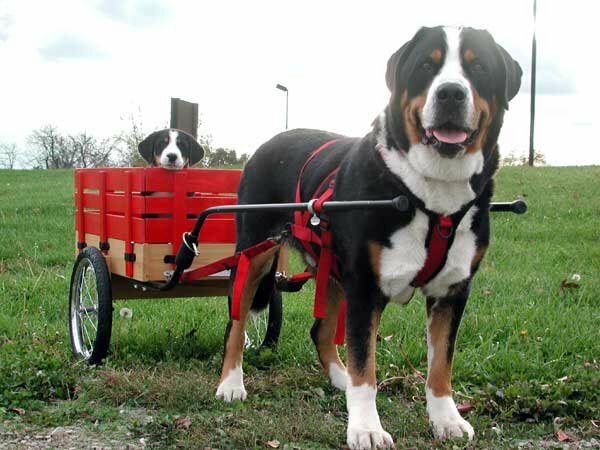 The Greater Swiss Mountain Dog, or Swissy as it is sometimes called, is a large, strong and confident breed with heavy bones and well developed muscles. The dogs body is a little longer than it is tall, and is covered with a dense coat of approximately one to two inches in length. The coat is black on top, with white and rust colored markings on the body. The head is flat and broad with almond shaped, medium-sized brown eyes, and in adults the nose is black. Rust markings adorn the underside of the Greater Swiss Mountain Dogs medium sized, triangular ears. The dog has a thick tail that tapers only slightly at the tip. The tail is occasionally elevated and curved in an upward fashion when the dog is in motion or excited. 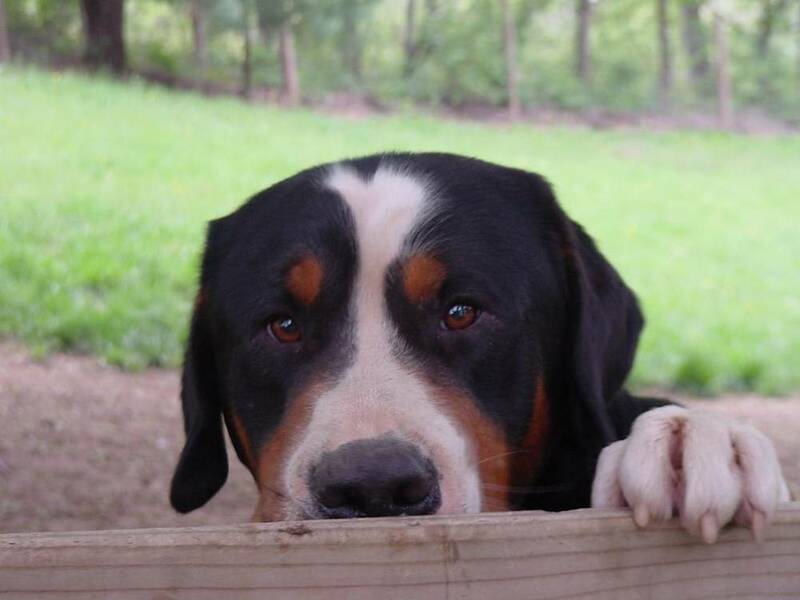 Height (Male) 25 - 29"
Common Misspellings Great Swiss Mountain Dog. The breed is quick to learn and can be trained with relative ease. The Greater Swiss Mountain Dog is very territorial and will not appreciate perceived intruders, however the breed is generally quite good with children and other pets, and works hard to please its owners. With its loud, deep bark and large size, the Greater Swiss Mountain Dog can provide protection and serve as an intimidating watchdog. 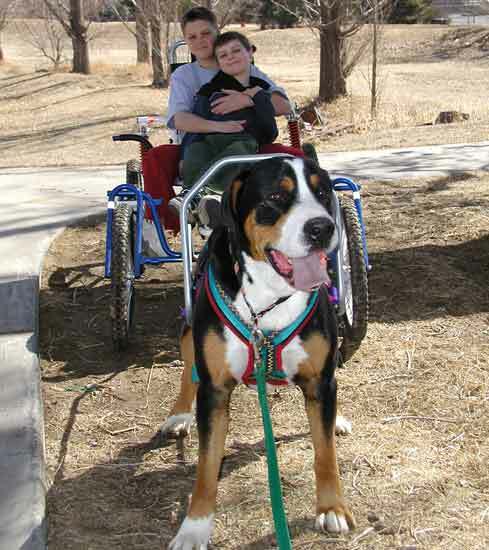 Over all the Greater Swiss Mountain Dog is an easygoing companion that is happiest when it is curled up in the living room with its family. The breed is considered an average shedder, and brushing on a fairly regular basis should be sufficient. 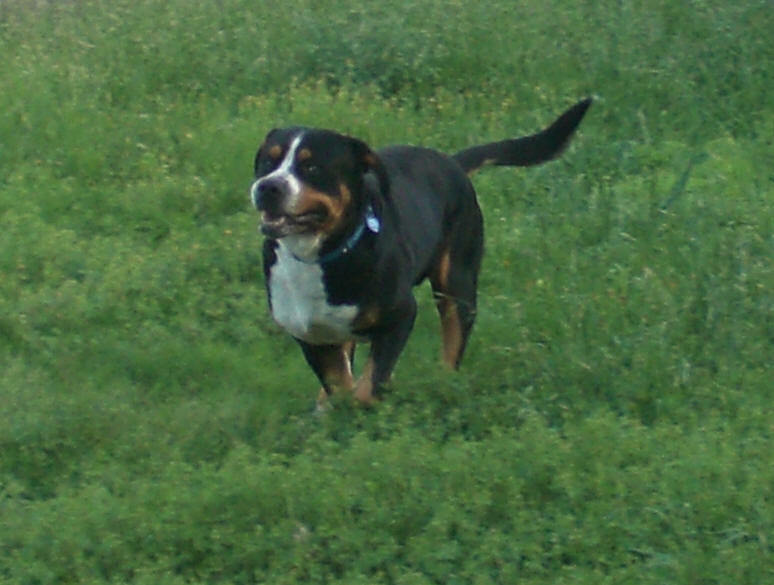 The Greater Swiss Mountain Dog only requires moderate exercise to stay healthy, although the more is better rule certainly applies. A daily walk will usually suffice, however running and more vigorous forms of exercise such as cart pulling will often improve the health and temperament of the dog. Canine hip dysplasia is the most common health problem seen in this breed; other less common problems include distichiasis, panosteitis, gastric and splenic torsion, urinary incontinence and seizures. The largest and oldest of Switzerlands four Sennenhunde breeds, the Greater Swiss Mountain Dog was introduced to the Alps by the Romans roughly 2000 years ago. There, these dogs served as herders, guardians and draft animals for hundreds of years; the breed also likely played a hand in the development of the Saint Bernard and Rottweiler. 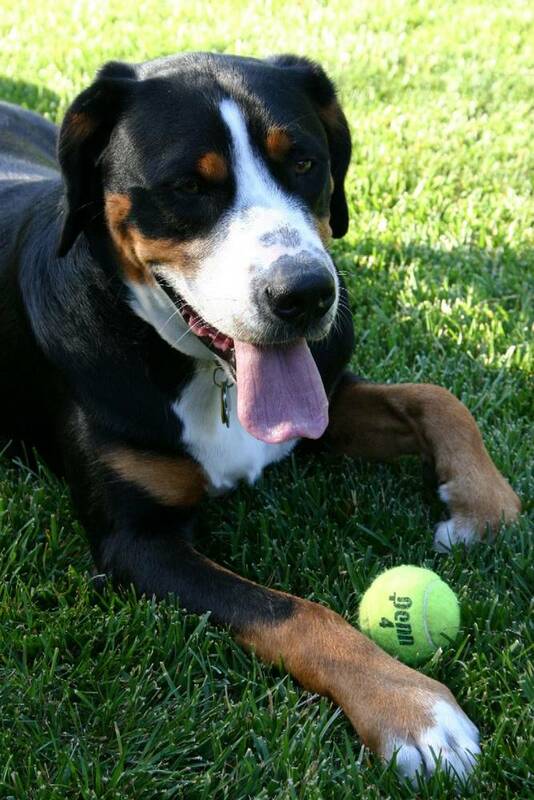 By the late 19th century the Greater Swiss Mountain Dog was believed by many to have become extinct. But in 1908 these fears were laid to rest when Zurich dog expert Professor Albert Heim spotted a Swissy at a dog show. 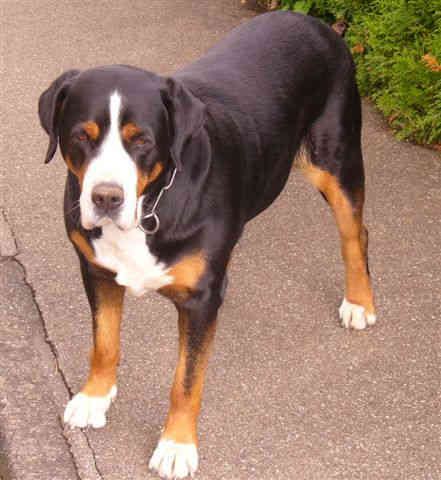 The dogs owner thought he had a Bernese Mountain Dog, and was rather pleased to learn from Professor Heim that it was in fact an exceedingly rare Swiss Mountain Dog. With Heims help other specimens of the breed were located in the Alps, and renewed breeding of the dogs began; the Swiss Kennel Club recognized the breed in 1910. The breeds progress was slowed by World War II, and the dog did not make it to the United States until the 1960s. 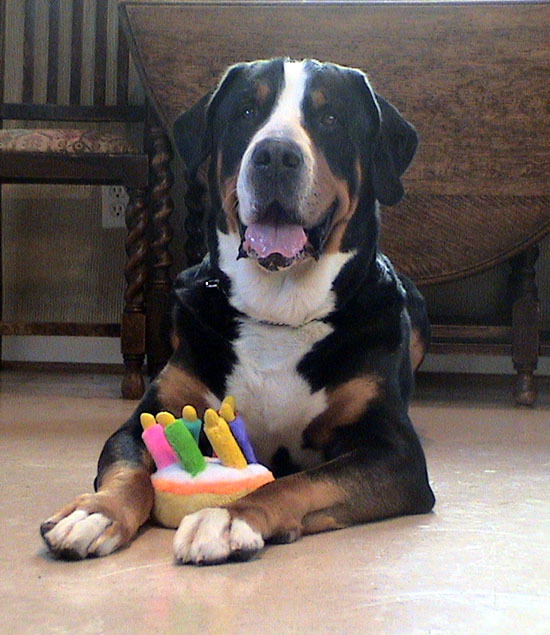 The Greater Swiss Mountain Dog Club of America was formed in 1968, and the breed was admitted into the American Kennel Club Miscellaneous Class in 1985; full recognition as a member of the Working Group came in 1995.